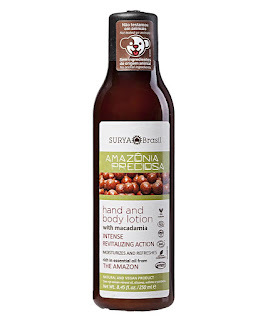 Surya Brasil's Amazonia Preciosa Hand and Body Lotion is a 100% vegan, natural and organic hand and body lotion. It is certified by EcoCert®. It is a lightweight and hydrating lotion that locks in moisture to create silky, soft, touchable skin. This lotion contains aloe vera, babaçu seed oil, macadamia seed oil, ucuuba nut butter, cupuaçu seed butter, Vitamin E, glycerin, cocoa seed butter, and essential oils of eucalyptus, citronella, orange, cassia, ylang ylang, styrix tonka gum, juniper, açaí oil, buriti and preciosa oil. Never tested on animals, Surya Brasil products do not contain sodium laureth sulfate, parabens, artificial coloring, artificial fragrance, solvents, mineral oil or GMO's. All of the products have been hypoallergenic and dermatologically tested. This lotion is a great product. When you first apply it you can immediately smell the aroma of all of the essential oils in the lotion. And they are pungent yet smell heavenly. This lotion applies well, it sinks right into the skin. Then there is no leftover feeling of greasiness that makes you feel as if you just applied lotion. There is the leftover scent of the lotion which is a nice scent. It is exotic. You can almost smell the market in Brazil where this kind of thing would be sold. Skin definitely feels soft and touchable after using this. I would recommend it for skin that is not too dry. Skin that is normal. Drier skins would want something that is more moisturizing and hydrating. This is a little light for drier skins except maybe in the summertime. 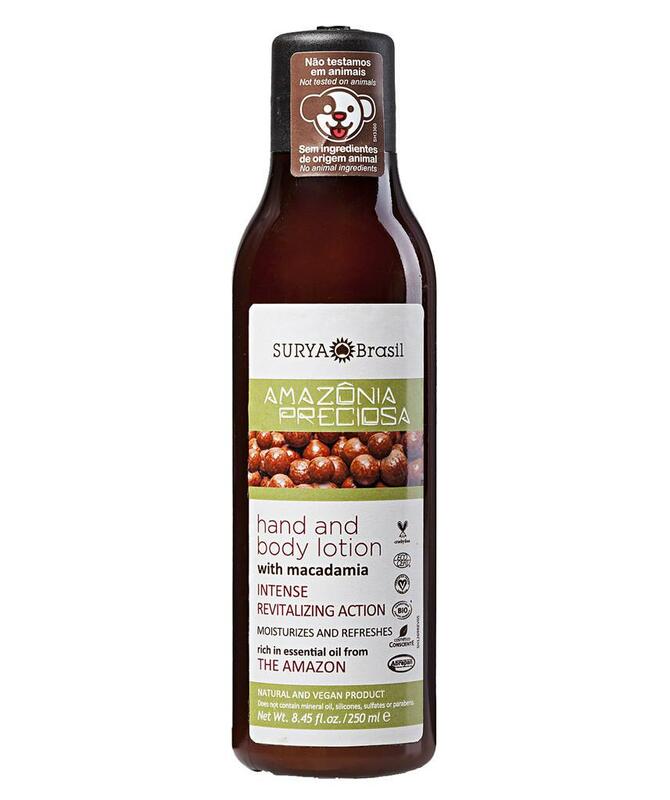 Surya Brasil Amazonia Preciosa Hand and Body Lotion retails for $34.00 per 8.45 fl.oz./250mL. It is available from www.suryabrasilproducts.com. Like Surya Brasil on Facebook: https://www.facebook.com/suryabrasil; Follow Surya Brasil on Twitter: @suryabrasil; Follow Surya Brasil on Pinterest: https://www.pinterest.com/suryabrasil/; Follow Surya Brasil on Instagram: https://www.instagram.com/suryabrasilbeauty/ and Subscribe to Surya Brasil on YouTube: https://www.youtube.com/user/suryabrasil.